Do you require an optimised Social Media Marketing Strategy to reach your business goals? Do you want your business to stand out from the crowd and start engaging with your target audience on popular social media channels like Twitter, Facebook, Google+, LinkedIn, YouTube, Pinterest, and Instagram? If you answered yes to any of these questions, keep on reading. Let us help you reach your business goals and objectives with social media marketing. Our social media marketing solutions are custom built on your business goals and objectives. Engaging with your target audience is key with social media. The question is – how do you start your social communication strategy? With our help you can start building meaningful relationships with your target audience. Social media can become time intensive when you are not following a specific campaign or strategy. 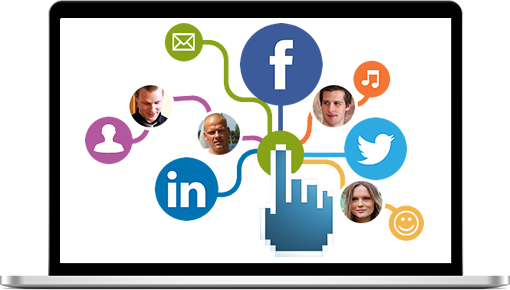 We provide you with a complete social media strategy and campaign calendar based on the needs of your target audience. With a campaign from us, you can enjoy a higher return on investment on your social media marketing strategy. We specifically integrate your business goals and objectives with your campaign and all the measurements. The key with social media is not having a social media strategy, but being social. With our simple solutions and processes, we will show you how to integrate social media within your business to grow and enrich your community. These are some the channels we utilise in our campaigns. Facebook isn’t big, it’s massive and there’s no sign of it losing momentum. Facebook is a great channel to humanise your brand online. Twitter’s real time nature is a gold mine when utilised correctly. News travels faster on this medium than any other in history. Use it. LinkedIn is the most powerful professional social networking channel. Build authority and credibility on this online network channel. Blogging is still the heart and soul of social media. Your message always needs a origination point. Use your blog as the center point. Even though all the popular social media channels are known to many like Facebook, LinkedIn, Twitter and Google+, only having profiles on these channels doesn’t mean you have a social media marketing strategy. We research your target audience to find out exactly on which social media channels they can be found and what types of content they enjoy consuming. Looking at the age groups on the left hand side you will see which groups are using social media the most, but in reality the gaps are narrowing as more people are getting accustomed to this social medium. Remarkable and trustworthy service. ABC of Internet Marketing have proved themselves pioneers in the digital space since our first meeting. I recommend any business looking to build authority online to make use of their services. Bottom line. If you are looking for a website that will impress your target audience and guide them to take an action naturally through your sales funnel, ABC of Internet Marketing has the best option for your needs. Professional and trustworthy. Want to make it a pleasure doing business with you online? Looking for a solution that will last a lasting impression with your customers? By choosing ABC of Internet Marketing you have just automatically said yes to those questions.